As an angler and writer, I’ve had the opportunity to meet many dynamic individuals and organizations who are making a large impact on the outdoor industry. Many of them have a deep passion for the sport, mastery of their craft, and a genuine desire to share their knowledge with the next generation. My most recent interview was no exception. 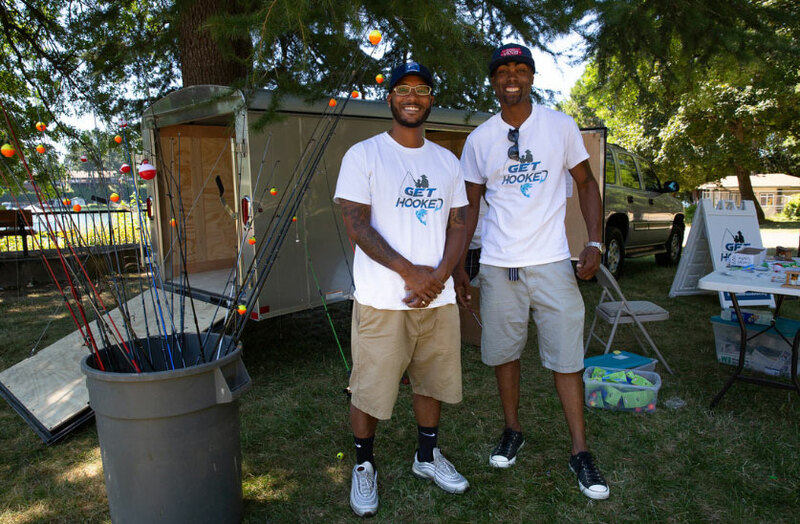 I had the opportunity to chat with Dishaun Berry and Philip Anderson, founders of the Get Hooked Foundation, an organization that is making an indelible impression in the lives of many youth and families throughout Oregon and Washington State. The Get Hooked Foundation was created to introduce children and families in at risk communities to the joy of the outdoors. Their mission is to provide education and inspiration to youth and families by submerging them into the world of outdoor recreation and sport fishing. Mentors for the programs are hand selected and work closely with children of all ages and from all walks of life to teach and to inspire. This unique program gives youth a solid understanding of the aquatic ecosystems that surround them, and helps them to develop the skills, knowledge and responsibilities associated with wildlife and conservation. By making these important life long connections it is the hope of the Get Hooked Foundation to defy cultural stereotypes and encourage the personal peace, fun, and quality family time that can be achieved through fishing and nature. Andre: What was the inspiration for the Get Hooked Foundation? Dishaun: I grew up in Inglewood, California. It was a violent and gang-ravaged area. My family moved to Portland to escape this violence, only to find a growing gang influence in Oregon as well. Going fishing and spending time outdoors kept us out of trouble and brought happiness and to our lives. Growing up in Northeast Portland, my first memories of fishing include selling worms to the Alberta neighborhood fishermen, riding my bike with friends to the ponds on nearby golf courses, and buying my first aluminum boat – without a trailer. Phillip: Dishaun initially taught me how to fish when I was a teenager. In a lot of ways, I was very similar to kids we work with now. They may want to fish but their families don't have the resources or the time. They don't know how to get into the sport. Luckily I was blessed with a good friend like Dishaun who was able to show me how. Now we are in a position to make a real difference. In addition to being the Co-Founder of Get Hooked and doing meaningful work in the schools, I’m also an Oregon Department of Fish & Wildlife Angler Educational Instructor. Andre: Tell me a bit about your life prior to starting the Get Hooked Foundation. Dishaun: I bought my first boat from a salvage yard. In order to go fishing, the boat was tied to the roof of my car, a 2-door Chevy Cavalier! The trolling motor was powered by my car battery. I literally had to take out my car’s battery every time I went on the water. My motto was, and still is today – nothing gets in the way of fishing! I worked in Corporate America for 13 years. After that, I decided to work with my brothers on the YouTube fishing series N.I.G.G.A.S (Never Ignorant Getting Goals Accomplished) on Da River, also known N.O.D.R. The series ultimately turned into a popular TV show on Carbon TV. While still a successful series, I founded Get Hooked Foundation to focus on my true passion: fishing and working with the youth in the community I grew up in. Phillip and I are aiming to build a stronger sense of community through a common interest- fishing. Andre: Who taught you how to fish? Dishaun: My grandfather got me into fishing. I was this black kid who was fortunate enough to see things that my community wasn't seeing. I traveled in an RV. I lived outside and went fishing all the time. My grandfather fostered that in his family, and it has made a huge impact on my life and perspective. Andre: Do you have a favorite Get Hooked moment? Phillip: There's not one specific moment. It's every single moment from unloading the trailer, to putting the bait on, to the last person leaving our event. The things I tend to remember are the smiles and the interactions with the kids. You can't put a dollar amount on it. You can't bottle that feeling up. It's just intoxicating. We always talk about how much joy we have on a daily basis. It's a blessing. Andre: What do you hope the kids and their families take away? Phillip: You have to learn patience with the fish. You see the families out here waiting in line. Everybody is patient. I think that translates on the water as well. It's not always going to come easy. That’s how life is, too. Dishaun: Most of the time, it's not even about catching a fish. That is a bonus. My goal is just to get parents and kids outdoors and away from the things that are plaguing us today – like social media, the Internet and television. We're almost in a health crisis because we don't get outside enough. The Black American Outdoorsman Company is a veteran owned and operated, full service outdoor business. They offer a variety of different products on their company website. On these social media platforms we create, manage and distribute quality outdoor content to a diverse audience of over 35,000 viewers. Our Black American Outdoorsman staff and followers produce a multitude of video, photo, and written content that displays the incredible talent outdoorsmen and women possess.